This book is a forum for exchanging ideas among eminent mathematicians and physicists, from many parts of the world, as a tribute to the first centennial birthday anniversary of Stanislaw Marcin ULAM. This collection is composed of outstanding contributions in mathematical and physical equations and inequalities and other fields of mathematical and physical sciences. It is intended to boost the co-operation among mathematicians and physicists working on a broad variety of pure and applied mathematical areas. 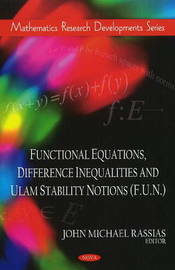 This transatlantic collection of mathematical ideas and methods comprises a wide area of applications in which equations, inequalities and computational techniques pertinent to their solutions play a core role. Ulam's influence has been tremendous on our everyday life, because new tools have been developed, and revolutionary research results have been achieved , bringing scientists of exact sciences even closer, by fostering the emergence of new approaches, techniques and perspectives.